BILL NYE  AND THE COWBOYS. Why He Apprehends an Incursion of Old-World Amateurs. The Effect of the Buffalo Bill Show on the European Youth—What We May Expect When B. B. Reopens the Roman Coliseum  —The Real and the Ideal Cowboy Contrasted—Last of the Red Man. The cable news from London would seem to indicate that the coming year will witness a large hegira of armed goslings from England who intend to prosecute the cow gentleman and Deadwood stage-robbing business on our frontier. It is perhaps unnecessary to state that Buffalo William, the graceful and courteous hirsute wonder from Nebraska, is largely responsible for this. Wherever he has gone with his eccentric, dark-red, self-made Indians and his speckled broncos he has sown the seeds of discontent in the grammar schools and bred open rebellion and mutiny in the primary department. Look along the red-hot trail of B. William and you find the American and foreign youth turning with undisguised loathing from his educational pursuits to immerse his legs in a pair of chaperajos, to wield the brief but stinging quert, to whoop up the red-eyed, haughty and high-tailed Texan Maverick, or shoot large, irregular holes into the otherwise poorly ventilated savage. And what is to be the result of all this? I do not ask it in a light or flippant manner, but in a tone of deepest solicitude. 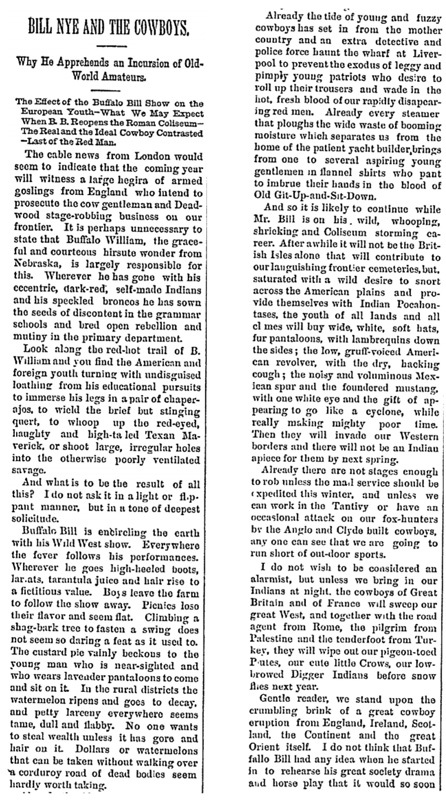 Buffalo Bill is encircling the earth with his Wild West show. Everywhere the fever follows his performances. Wherever he goes high-heeled boots, lariats, tarantula juice and hair rise to a fictitious value. Boys leave the farm to follow the show away. Picnics lose their flavor and seem flat. Climbing a shag-bark tree to fasten a swing does not seem so daring a feat as it used to. The custard pie vainly beckons to the young man who is near-sighted and who wears lavender pantaloons to come and sit on it. In the rural districts the watermelon ripens and goes to decay, and petty larceny everywhere seems tame, dull and flabby. No one wants to steal wealth unless it has gore and hair on it. Dollars or watermelons that can be taken without walking over a corduroy road of dead bodies seem hardly worth taking. Already the tide of young and fuzzy cowboys has set in from the mother country and an extra detective and police force haunt the wharf at Liverpool to prevent the exodus of leggy and pimply young patriots who desire to roll up their trousers and wade in the hot, fresh blood of our rapidly disappearing red men. Already every steamer that ploughs the wide waste of booming moisture which separates us from the home of the patient yacht builder, brings from one to several aspiring young gentlemen in flannel shirts who pant to imbrue their hands in the blood of Old Git-Up-and-Sit-Down. And so it is likely to continue while Mr. Bill is on his wild, whooping, shrieking and Coliseum storming career. After a while it will not be the British Isles alone that will contribute to our languishing frontier cemeteries, but, saturated with a wild desire to snort across the American plains and provide themselves with Indian Pocahontases, the youth of all lands and all climes will buy wide, white, soft hats, fur pantaloons, with lambrequins down the sides; the low, gruff-voiced American revolver, with the dry, hacking cough; the noisy and voluminous Mexican spur and the foundered mustang, with one white eye and the gift of appearing to go like a cyclone, while really making mighty poor time. Then they will invade our Western borders and there will not be an Indian apiece for them by next spring. Already there are not stages enough to rob unless the mail service should be expedited this winter, and unless we can work in the Tantivy or have an occasional attack on our fox-hunters by the Anglo and Clyde built cowboys, any one can see that we are going to run short of out-door sports. I do not wish to be considered an alarmist, but unless we bring in our Indians at night, the cowboys of Great Britain and of France will sweep our great West, and together with the road agent from Rome, the pilgrim from Palestine and the tenderfoot from Turkey, they will wipe out our pigeon-toed Piutes, our cute little Crows, our low-browed Digger Indians before snow flies next year. Gentle reader, we stand upon the crumbling brink of a great cowboy eruption from England, Ireland, Scotland, the Continent and the great Orient itself. I do not think that Buffalo Bill had any idea when he started in to rehearse his great society drama and horse play that it would so soon disturb international relations and throng our cactus forests and greasewood vineyards with juvenile cowboys from Greenland's icy mountains and India's coral strands. If he had he would have hesitated about it. Now, alas! it is too late. He is billed for the Coliseum, and already people from Lyrsilla and the citron groves of St. Lawrence County are coming into town, bringing their dinners and hitching their teams to the fence behind the Coliseum. Hard, blue preserved seats, I am told, are being erected around the amphitheatre, and the Roman schools are closed. Everything points towards a great festal day, if that would be the right kind of day to use in this place. Is it to be wondered at that we will soon see Roman cowboys who ought to be in school landing here on our coasts and inquiring at the corner of Broadway and Chambers street where they can find an Indian out-break to quell? May we not look for the Arabian and Chinese contingent by next spring, armed to the teeth and asking at an Intelligence office when the Deadwood stage is expected, so that they can attack it and rob it a few times? Yet who but Col. Cody would have thought of going to the four corners of the earth with such a show? Who but he would have hired the Coliseum after its long, dull and disastrous season? Now, however, that he has opened the way it will be no boubt the beginning of an era of prosperity for that great place of amusement, and the Wild West Show will be followed very likely by stereopticon entertainments and a humorous lecture. In that way Buffalo Bill is a benefactor, for the long and painful silence that has settled down for centuries about the galleries and dim foyers of the Coliseum will be broken and the thrilling tones of "Curfew shall not ring to-night" will jar the chinking out of the crumbling walls that in years past resounded with the applause of the Roman populace as Spartacus told the people that he was not always thus. May it not be that in future years, now that the Coliseum is to be thrown open, Joshua Whitcomb  will jerk his old hair trunk across the arena which once caught the warm blood of Aurelius Portcullis as he slowly fed himself to a fierce Numidian lion, while the band played "Read the Answer in the Stars?" How long will it be before Mr. Adonis E. Dixey will deliver milk where once the fat and wheezy Roman Prætor said there were no noble men but Romans and Ohio men? Can it be that Mrs. Langtry  or Mrs. James Brown Potter  will some day rent the Coliseum for a whole season and wear their good clothes where centuries ago, the gladiator, wearing a belt with a frill to it and armed with a cast-iron toadstabber, bowed to the Roman Prætor and asked him to kindly turn in a few ringtail tigers from Farther India and would he show the audience how a grown-up tiger looked inside? May not Mr. Kiralfy in the near future show the wondering decendants of Aurelius Rutabaga Trifoliatus how Babylon looked while in the act of falling and throw upon the walls of the Coliseum the celebrated handwriting which nobody but Daniel ever could make out? I can see that in a dramatic way Buffalo Bill has opened up a new route, besides starting towards America a perfect swarm of amateur cowboys who desire to cross the plains and rescue a beautiful young lady who is walking from Julesberg to Walla Walla wearing a perle francaise dress, the front veiled with Hoboken "rick-rack" en tablier, Pompadour panels of creme A-shaped faille franchise, en bouffant, lined with oyster velvet and edged with heavy elephant's-breath silk cord, while in the V-shaped corsage nestles a large bunch of Marshal O'Neil roses. My sympathies are with the people who live in the West and who resent this thing. For many years the people who dwell in the Territories have been annually visited by young people from the older portions of the country or from England who desired to give themselves up to carnage. Now the prospects are that the influx will be even greater than ever, and I would advise the people who dwell in the far West to arm themselves with eggs or some other groceries that will not hurt and be prepared. I saw one of these kindergarten cowboys get off a train once and go up through the town. Afterwards I saw him come back. He looked different somehow. When he got off at the station I noticed that he had long hair which was tied back with a pale-blue watered silk ribbon. He had long legs which seemed to extend from his Adam's-apple to the ground. A narrow, red four-in-hand nectie denoted where the legs terminated and the head began. He looked real sweet. When he took the train there was nothing by which to identify him except a strawberry mark which he carried carefully concealed in a shawl strap. Boys who sigh to dash madly across the plains or follow the cowpath to fame do not know of the dangers and desolation such a life involves. There are two classes of cowboys in the West, viz., the working cowboy and the lay-figure cowboy. The latter remains in town and rolls cigarettes, which he smokes fiercely through his nose. He talks learnedly of cattle brands, corrals, round-ups, "cavvyards," ranges, bands, bunches and herds, but doesn't really know a range cow from a Texas steer. The genuine cowboy is not always beautiful, but he is conversant with his business, knows every brand in his district at least and who owns it; is brave where bravery is most needed, that is, in the discharge of his duty. To stand watch all night in a blizzard and hold a band of restless, bellowing cattle from stampeding, to ride all the next day half asleep in his saddle, to fall occasionally from his pony when the latter makes a mistake and steps in a prairie dog village, or to have a collar-bone broken when fifty miles from a physician, are some of the features of cowboy life which the boys who run away from school to cross the Missouri do not consider. Moreover, it would be well if every boy in America or elsewhere would write in his own hat with a blue pencil that there is no rose-bordered road to success and that even the man who is born beautiful and marries rich has to fight his way. The great West does not so sorely need pretty men with buckskin clothes as it does good citizens who are willing to work. Wherever the sun shines or grass grows and water runs, the young man who will give a good day's work for a fair day's wages will surely be promoted as he deserves it. It may not be funny, but it is the never-dying truth that industry, integrity and perseverance are mighty good substitutes for symmetry, genius and hair.—Bill Nye, in New York World.